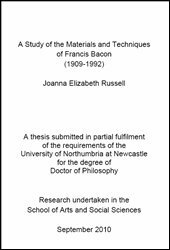 Joanna Elizabeth Russell, A Study of the Materials and Techniques of Francis Bacon (1909-1992), 2 volumes, Northumbria, Northumbria University at Newcastle, 2010. Está aqui (é necessário registo prévio gratuito). The materials and techniques used by Francis Bacon were studied through the examination of paintings and the scientific analysis of paint samples. Samples were taken from 21 complete works by Bacon, and from 17 abandoned canvases left in the Artists’ studio, most of which had had large sections cut out and removed. The works sampled range in date from c.1945 to c.1990. Materials left in Bacon’s studio, now preserved at Dublin City Gallery The Hugh Lane were also studied and 100 items were sampled. Samples were analysed using Gas Chromatography Mass Spectrometry (GCMS), Scanning Electron Microscopy with Energy Dispersive X-Ray Analysis (SEM-EDX), Polarised Light Microscopy, Fourier Transform Infrared Spectroscopy (FTIR) and Pyrolysis Gas Chromatography Mass Spectrometry (PyGCMS) to identify both pigments and binders. A reference collection of synthetic organic pigments was subjected to analysis using FTIR and PyGCMS in order to build up reference data for the identification of these materials in paint samples. Major FTIR peaks are reported for over 120 different pigments, and pyrolysis products from over 70 pigments. PyGCMS was used to analyse many pigments which have not previously been studied in the literature by this method, including diketopyrropyrrole, isoindolinone and perylene types.The existing literature on Bacon’s materials and techniques was surveyed, and information from letters, receipts and other documentary sources was compiled. Supports, primings, pigments and media were compared for the paintings studied, revealing a great deal of consistency in materials used over a long working life. Oil paints were used throughout for figures, but a range of different paints are used in backgrounds to create different textural effects, with household emulsion paints found on several works from the 1970s and 80s. The conservation issues arising from Bacon’s use of materials are also explored. The results were used to examine a small number of test cases to see how similar materials were to those in Bacon’s usual practice. Results showed strong similarities to works examined in the study in some cases.